I had invited a couple of friends over for dinner and I was contemplating ways of surprising their taste buds. I wouldn’t have taken up the gauntlet but for the bunch of fresh cilantro resting right next to it. The food processor was called to action. Ginger, garlic cloves, a medium sized onion, half a cup of yogurt and the whole bunch of cilantro were blended into a marinade in no time. The chicken pieces were coated in the marinade and set aside for half an hour. A drizzle of oil into the pan and in went the chicken. Fifteen minutes later my “Cilantro Chicken” was ready. At dinner time I boasted about my new recipe. But I didn’t receive the applause I was fishing for. After my friends left that day, I Googled “dhania (cilantro) chicken”. A bunch of recipes sprang up on the screen. I was preparing the same cilantro chicken, which I had once claimed to be my brainchild, for friends who were coming over for lunch. But this time it had to be ‘my cilantro chicken’. So I dry roasted a bunch of whole spices – black and green cardamom, cinnamon, clove, star anise, mace – and put them in a grinder. I sprinkled the powdered spices over the curry just a couple of minutes before turning off the gas burner. And I named it “Curry in a hurry”. 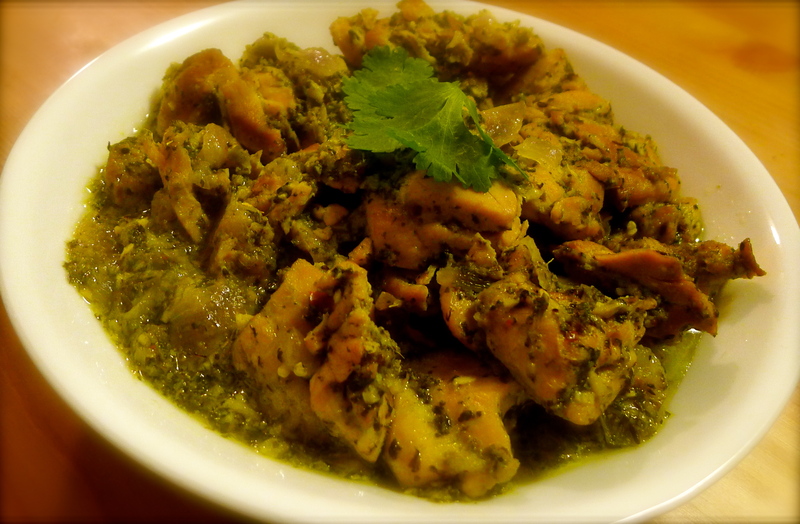 Categories: Chicken, Non-vegetarian | Tags: chicken, chicken curry, cilantro chicken, coriander chicken, curry, curry in a hurry, dhania chicken, roasted spices, spices | Permalink.